One Bedroom, One Bathroom. Sleeps Four. Beautiful condo in the heart of downtown Toronto. The one bedroom apartment boasts a modern kitchen with top of the line appliances fridge/freezer, Bosh stove, Bosh dishwasher, microwave and everyday necessities. Modern granite eat in island that seats two. Large living room with floor to ceiling windows, sofa turns into a double bed. Enjoy cable TV, wireless internet and local landline. The bedroom includes a queen size bed and large walk in closet. Families with children are welcome. You will always have things to do on King Street. Steps to the best live theater in Toronto as well as A-list restaurants. The Toronto International Film Festival (TIFF) is just down the street! Feel like a local and stop by a great grocery store 'Fresh and Wild' just around the corner of the building. Nearest Subway Station is St. Andrews on King Street and University Avenue, about 15 minutes by foot. The Spadina streetcar is outside the lobby door. The King Streetcar runs 24hours. PATH is downtown Toronto's underground walkway. Experienced owner, a Homeaway member since 2010. I am a mom, Real Estate agent that started short term rentals in 2010. I have several units in the Toronto area, as well as a lovely apartment in Arequipa, Peru. This is a job that I've truly learned to enjoy. I used to live in the King St and Spadina Ave area for many years before I got married and loved it! I loved how easily you can walk to shops, restaurants and night life. The shopping in Queen Street is fantastic. The apartment is very quiet since it's not facing a major street. It also has a huge walk-in closet. Eat in island, seats two. 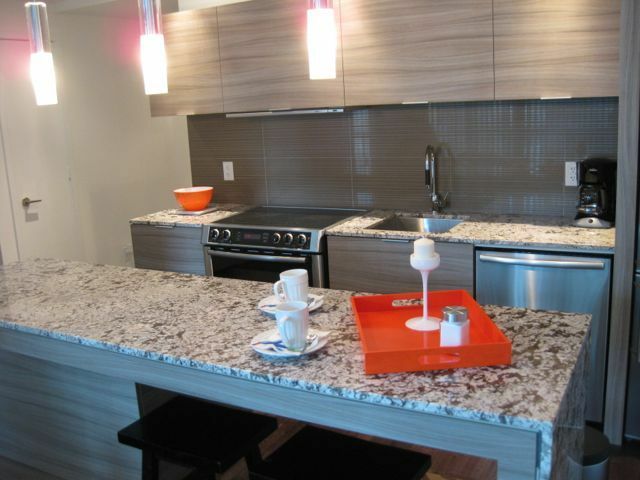 A wonderful, modern apartment with all the amenities in a great central Toronto location. I was in town for a conference, and the location was perfect for getting any where by foot, mass transit, or taxi. The apartment is comfortable and well-equipped. It is very modern and comfortable with lots of space including a huge walk in closet. There's always someone at the front door of the building to help, and access was incredibly easy. There is a great coffee and bakery as well as an organic food market just downstairs. I highly recommend it. I really enjoy my time in Toronto. The place was in a great neighborhood where you could easily find anything you needed. It was near lots of tourist attractions and the light rail stopped right out front so made it easy to get around the city. The apartment was nicely furnished and quiet. Gisella always quickly responded to any of my emails if I had any questions. I'd definitely stay here again!! Well-maintained, modern apartment with all the amenities. Absolutely perfect location with abundant restaurants, delis, shopping amd entertainment in the neighborhood. Loved our stay! The apartment was beautiful and comfortably accommodated the three of us. However, we were missing a few basic items. There were no paper towels, wash cloths, or extra towels. We also ran out of toilet paper with a day and a half left in our stay. Well appointed, attractive flat. Perfect place to explore down town. Very near tram stops and good bars etc. Gisella was responsive and flexible, and the apartment has everything you need. Felt like home away from home, and in a very convenient location for downtown, Queen Street, etc. An extra $25 per person per night if more than 2 people, maximum 4 people. I require 50% of rental fee at time of booking. The outstanding balance is due upon arrival as well as a $250 deposit against damage. (kept as damage deposit & refunded on departure).